As a couple undergoing or intend to undergo an IVF treatment, we understand that it is important to know a centre’s IVF success rates. But it is also important to know what success rates really mean. We pride ourselves in reporting the most current success rates so that you can make a sound decision before commencing the treatment. 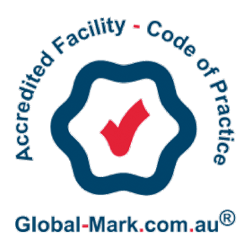 Additionally, our results have been compared against the ANZARD (Australian & New Zealand Reproduction Database) results and internationally certified during our routine RTAC (Reproductive Technology Accreditation Committee) certification. WHAT IS MY CHANCE OF GETTING PREGNANT? The chance of conceiving following treatment is variable. It is determined by many factors including the woman’s age, weight, duration of infertility (the shorter the duration, the better the chance), and the cause of infertility. The female partner’s age is a very important factor as it relates to the reserve of good eggs remaining in the ovaries. The following charts of FRESH EMBRYO TRANSFER, FROZEN EMBRYO TRANSFER AND CUMULATIVE PREGNANCY RATES are based on treatments completed in the year 2015. Embryos that have been produced using eggs retrieved after a controlled ovarian hyperstimulation, can be replaced into a woman’s womb at the same cycle, however, the side effects of the fertility drugs and elevated hormones may deter a pregnancy from happening. It is evident that pregnancy rates with FRESH embryo transfer in IVF cycles are less than ideal. It was demonstrated in Europe that the average clinical pregnancy rates was at 32% (Ferrareti et al., 2012). 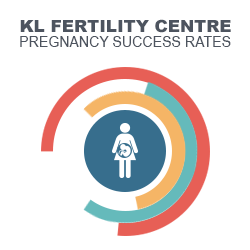 At KL Fertility Centre, we still perform FRESH embryo transfer and the success rates can be seen on our chart. This chart shows the clinical pregnancy rate per embryo transfer and includes both IVF and ICSI cycles as well cycles using donor sperm (treatments done in year 2015). Permits the uterus environment to return to normal (non-stimulated) after IVF medication, providing natural embryo implantation conditions. Allows for genetic screening, greatly increasing the chances of successful pregnancy and healthy birth. Prevents Ovarian Hyperstimulation Syndrome (OHSS) which can be fatal if it is not properly managed clinically. Preserves all viable embryos through embryo freezing, making it easier to select single embryo transfer and thus greatly reduce the possibility of multiple gestations (pregnancy of twins or more) and the associated health risks. Is less expensive for multiple transfers than repeated fresh IVF cycles. It is evident from our extensive experience and practice that FROZEN embryo transfers yield better outcomes compared to FRESH embryo transfers owing to the competency of Embryologists at cryopreserving and thawing of embryos and replacing the embryos in an unstimulated (natural) environment. This chart shows the clinical pregnancy rate per frozen embryo transfer and includes frozen embryos cryopreserved in different years. This is also known as pregnancy rate per egg retrieval. The rate considers also the pregnancy outcome of the corresponding thawing cycles (Frozen embryo transfer cycles). This means, a pregnancy is counted once if at least one pregnancy was archived in the fresh or in one corresponding thawing cycle. 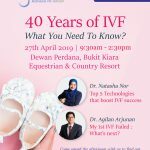 It also signifies a woman’s chances of a pregnancy over an entire treatment period and is most relevant to a couple’s decision on whether to undergo the IVF treatment. The following results are based on all IVF treatments completed in 2015. This chart shows the cumulative pregnancy rate per embryo transfer and it includes both IVF and ICSI cycles using donor sperm. At KL Fertility Centre, we are constantly updating the success rates as pregnancy data collection is an ongoing process, as more and more patients are trying to utilise all of their frozen embryos. Our aim is to provide you a clear understanding of your chances of getting pregnant when you commence an IVF treatment with us. Data does not include patients using our donor egg program or patients having genetic testing and in addition, do note that not every IVF treatment cycle commenced will result in an egg collection, an embryo transfer or embryo to freeze.